Cooking Modern Mexican Street Food is one of my all time favourite things to do. Recently I had a dinner party for 16 that got everyone eating amazing food, and of course, drinking Margaritas. It was a foodie crowd so I wanted to do some different dishes to “splash” out a bit. The menu read something like this, black bean dip w/ plantain chips/ blue corn tortillas, authentic guacamole, fire-roasted salsa, grilled pepita crusted seared scallops, beer battered jalapeño poppers, slow cooked achiote pork, chicken mole, jicama salad w/ cucumber, pineapple, pomegranate dressing and Day of the Dead sweet Tamales with cajeta sauce. It was a spectacular night of food, but what I loved is how food gathers people and brings them so much joy. This is always clear in our Team Building events at VictorsFood. 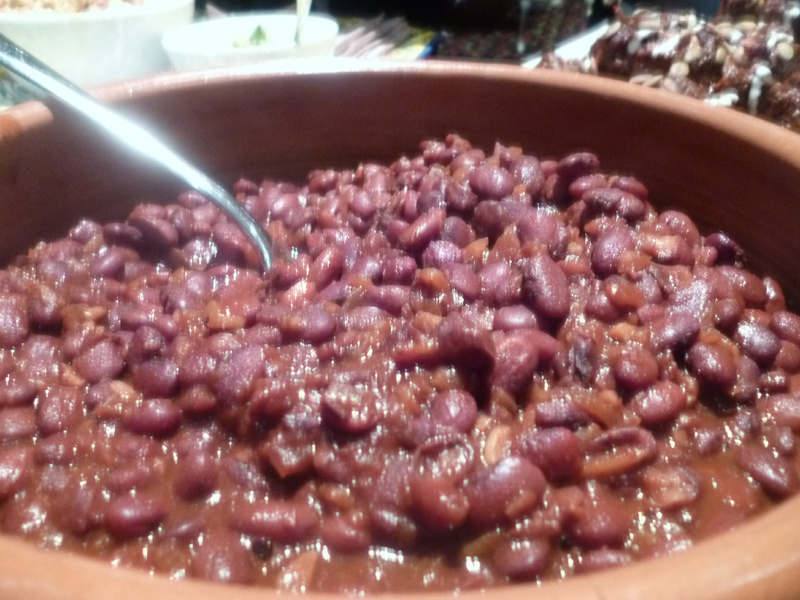 The one dish everyone raved about was the “Drunken Beans” which they devoured. So I thought I would share this recipe with you so let me know if you like it. It’s really really really good! Also please join me for my Mexican Street Food cooking class coming up on Saturday Oct 4 as we will make some of the above dishes to share and enjoy! Don’t you just love to cook? In a large pot, place the beans. Add water to cover the beans by at least 2-3 cm. On medium-high heat, slowly bring to a boil. Reduce the heat to medium. Water should bubble slowly. Beans soak up water and expand, so top up the water as necessary. Cook the beans until soft, about 1 hour. Drain and set aside. Heat the olive oil in a large pot on medium-high. Sauté the onion for 2 minutes. Add the garlic and sauté for another 2 minutes. Reduce the heat to medium. Add the brown sugar and molasses. Stir until dissolved. Add the beer, chipotle and tomato purée. Mix thoroughly. Add the beans. Continue to cook for 5-10 minutes, until thickened. Season to taste. Note: Cooking the beans slowly keeps them from falling apart. Add more chipotle chilli, molasses and sugar if you prefer a spicy or richer flavour. I loved those drunken beans . Amazing depth and flavour . The best !